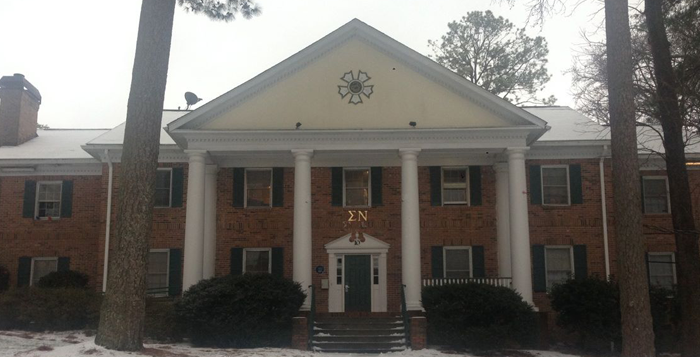 Emory University has suspended the Xi chapter of Sigma Nu fraternity for five years after the chapter accepted responsibility for violations of the University’s anti-hazing policy, found in an Office of Student Conduct (OSC) investigation this spring. Senior Associate Dean and Director of Campus Life External Relations Andy Wilson released a statement to the Wheel Friday outlining the University’s response to the investigation, which began after OSC received “an anonymous tip that a violation may have occurred,” according to the statement. Since Sigma Nu accepted responsibility for the hazing and did not appeal its decision, there was no hearing involved, Wilson said. A representative from Emory Sigma Nu has not yet responded to comment at this time. Sigma Nu is the fifth Emory Greek organization to face suspension for hazing violations since 2011, joining Alpha Phi Alpha fraternity, Delta Sigma Theta sorority, Alpha Epsilon Phi sorority and most recently, Phi Delta Theta fraternity ​in July 2013. Additionally, Emory Residence Life and Housing began conducting walkthroughs of fraternity houses in fall 2013 on Thursday, Friday and Saturday nights to check for rule violations. Typically, suspended organizations are eligible to return to campus four years after the announcement of their OSC ruling. However, Wilson said in an interview with the Wheel that the severity of Sig Nu’s violations warranted a five-year suspension. Senior Vice President and Dean of Campus Life Ajay Nair wrote in an email to the Wheel that this Sigma Nu chapter’s “egregious actions are incongruent with the University’s expectations and standards” and expressed his disappointment in the situation. “Fraternities, sororities and other student groups must realize that the privilege of existing at the university comes with great responsibility including ensuring the safety and well-being of new members,” Nair wrote. Sigma Nu also faced disciplinary action by the administration in 2008, where Sigma Nu members violated a number of housing policies and lost their privilege to live in a fraternity house on Eagle Row for a year. In 1998, the chapter was suspended for “psychological hazing” of its pledges. According to Wilson, sophomores assigned to live in the Sigma Nu house in the fall will be guaranteed housing elsewhere on campus, and juniors and seniors may appeal to have their housing contracts released or work with Residence Life and Housing to find other on-campus accommodations. Additionally, the status of the house at 10 Eagle Row is to be determined by Residence Life and Housing. Wilson added that the information leading to the investigation came via an anonymous tip and that OSC investigates any tip it receives. Emory’s Sigma Nu chapter was established in 1884 as one of the first Interfraternity Council chapters on campus. This article was updated at 4:51 p.m. on 5/11/2014 to remove the fifteenth paragraph, which stated further details about the specific violations would be provided to the Wheel on Monday. The University has communicated that they have nothing else to share at this time. This article was updated at 11:10 p.m. on 5/10/2014 to reflect a change in the twelfth paragraph that clarifies that juniors and seniors must appeal to have their housing contracts released. Thank you for pointing that out, the article has been updated accordingly! The picture doesn’t even show the Sig Nu house….